I keep warning, the Fed is going to hike rates until something breaks. And by “something,” I don’t meant a garden variety correction in the markets; the Fed has made it EXPLICIT that it would only consider slowing the pace of rate hikes if the markets entered a meltdown so massive that it actually impacted consumer spending. If you don’t believe me, consider yesterday’s Fed FOMC announcement. Following the worst month for stocks since 2008… a month in which some 89% of global assets went red of the year… the Fed didn’t even blink. 2) Reiterated that it will hike rates THREE more times in 2019 (rather than reducing the intended number to two or even one). 3) Made it clear that it will hike until it sees a negative impact on the REAL economy (the labor market or consumer spending). 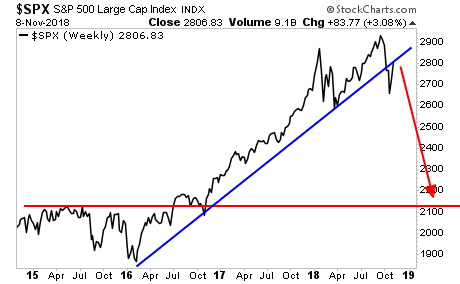 I routinely say that stocks are the last asset class to “get it.” Well they “got it” yesterday, slamming into former support. The stage is not set for a bloodbath as stocks meltdown to 2,100. These are the EXACT same trades we made in 2008 to return triple digit gains while the rest of the investment world got taken to the cleaners.